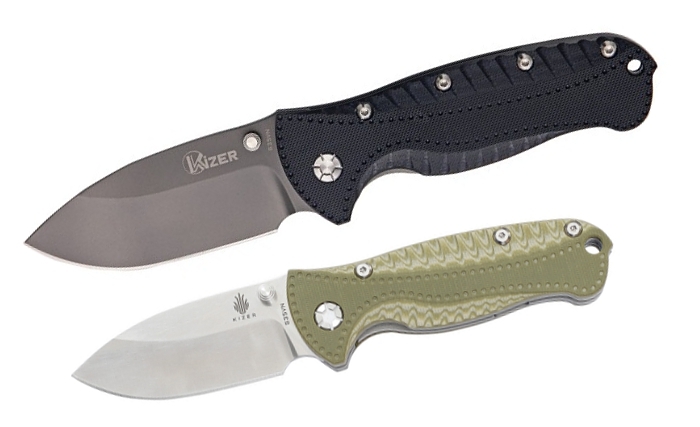 **** Chosen by Winner: David R.
This Kizer GTi Gingrich Design Large Hunter folding knife is sure to become one of your favorite everyday carry tools. The curved handle, finger groove, and textured G-10 handle scales make this knife both comfortable and secure in your hand. The titanium coated S35VN steel drop point blade can easily handle any of your heavy duty cutting and slicing tasks. The blade opens smoothly using the ambidextrous thumb studs, and the liner lock mechanism holds it secure during even your most challenging jobs. There is a right hand, tip-up titanium pocket clip for easy carry, and a lanyard hole in the handle end to give you additional carry options. The smaller folder features the same design on a smaller scale. Curved handle, finger groove, and textured G-10 handle scales make this knife both comfortable and secure in your hand. The satin finished S35VN steel drop point blade can easily handle any of your daily cutting and slicing tasks. The blade opens smoothly using the ambidextrous thumb studs, and the liner lock mechanism holds it secure during even your most challenging jobs. There is a right hand, tip-up titanium pocket clip for easy carry, and a lanyard hole in the handle end to give you additional carry options.